Short Cases in Surgery, 6th edition is, in its present form, a new edition and not merely a reprint. The purpose of this new edition remains the same as those of the previous editions. The entire text has been thoroughly revised and updated. Two new chapters, soft tissue sarcoma, and intestinal stomas have been included. The aim of this book is to help the students, who are preparing for qualifying examinations, in readily grasping the problems of surgery-the problems they have to tackle in their examinations as well as in the wider world outside the examination halls. 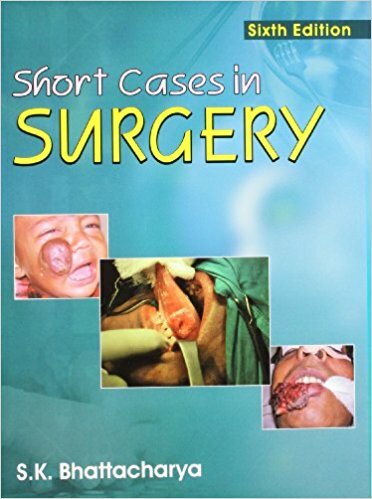 The main features of the book is: Most of the surgical problems which are very often posed as ‘Short Cases’ in examinations have been adequately discussed. Each problem has been explained with arguments from all the three dimensions of medical knowledge-anatomy, physiology and pathology. Also the principles of surgical operations have been briefly laid down, wherever possible. Discussion has been, whenever necessary, amply illustrated with schematic diagrams to facilitate easy and ready understanding of the subjects. Precision is the hallmark of this book. While no necessary information or explanation has been left out, the subjects have been presented in a neat and pointed fashion. The book provides necessary aids for ready recapitulation of the important features of problems and their solutions.